Shirts With Random Triangles: LSU suspends punter Brad Wing for Chick-fil-A Bowl after failed drug test. 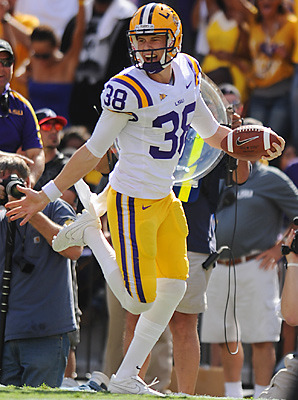 LSU suspends punter Brad Wing for Chick-fil-A Bowl after failed drug test. Another LSU cult favorite player from the 2011 season has been reportedly suspended on drug related issues. Punter Brad Wing, whose notoriety last year inspired a dance move, has been suspended for the New Year's Eve Chick-fil-A Bowl in Atlanta. He has reportedly failed a drug test, according to TigerRag.com. "According to one source in the athletic department, Wing’s suspension is related to a failed drug test. Wing was suspended for LSU’s opener against North Texas, also a result of a failed drug test, the source said." LSU claimed at the time that Wing sat out the North Texas game due to a "sore hamstring."